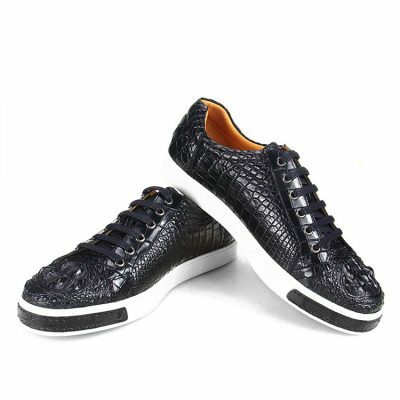 Crocodile shoes, men’s genuine crocodile skin shoes for sale, all these genuine crocodile skin shoes are free shipping worldwide. We only offer high-quality and high-end crocodile shoes to our consumers. Crocodile shoes are a trend these days. This is especially those hand stitched and handcrafted shoes. The animal skin, stitched by hand, produces shoes that are incredibly soft and comfortable to wear. Crocodile shoes are an amazing pair that you will never regret to have in your shoe collection. If you are a fashion-forward guy who likes to get attention wherever you go, a pair of good quality and stylish crocodile shoes is what will take you there. Crocodile shoes are now the newest trend today. They are now a luxury among shoes that owning one gives people more reason to talk about you. Seriously, who would not feel compelled to look at you if you are wearing stylish and luxurious reptile skin shoes? These shoes never fail to catch people’s eyes. And, if you are a man always hopes to make an impression, then a pair of crocodile shoes is what you need. A symbol of luxury, crocodile shoes always brings great value to your money. If you are a man that serves the head of a company, a CEO, a General Manager or a President, crocodile shoes will bring you lasting impression to your customers, employees, partners, and investors. In business, you always need to be put together to show an air of elegance and class, which a crocodile shoe effortlessly shows. Every inch of VANGOSEDUN’s crocodile shoes is quality, having been hand-stitched and handcrafted by expert shoemakers. Made using the highest quality materials, polished and finished by expert hands, you will never regret a pair of crocodile shoes among your collections. Have you decided that now is the time to buy the crocodile shoes you have been wanting? You were able to save enough money to buy the crocodile shoes you saw online and you are ready to finally spend it now. However, it would be wise if you will take the time to read more about crocodile shoes and make sure you are paying for genuine crocodile shoes. How to know if it is the right crocodile shoes? How do you know if your choice of crocodile shoes is the right one? The leather used for crocodile shoes should be made from the skin of a real crocodile. Often, they use skin from a baby crocodile of crocodile species including Siamese crocodile, saltwater crocodile, American crocodile, and Nile crocodile. They also use the skin of Caiman crocodile at other times. But, to make solid shoes, it is the skins of Hornback and Nile crocodiles that are the best choice. Crocodile shoes made from Nile crocodile skin are softer and more flexible. They are also able to easily bend without any kind of marks from developing. There are different colors of crocodile skins for exotic shoes available. Manufacturers of crocodile shoes can change the color of the crocodile skins to a wide variety by process of dyeing and tanning. Among the different colors, black and brown are the most common while there are also red-orange, gray, silver and blue.
. Classic finish – This finish is shiny, smooth and more processed, with any visible natural imperfections of the crocodile skin hidden. When bending the shoes, visible marks may show.
. Safari gloss – This finish is more popular because of the attractive semi-glass appearance, not to mention its superior durability and strength. In addition, the safari gloss crocodile shoes show no visible signs or wear and tear even when flexed repeatedly. Likewise, the shoes become richer and deeper in color with time. Besides knowing all these things, it would help you to know about the most popular designers and manufacturers of crocodile shoes. With exotic shoes, you want the best and of equal value to your money. You can only get that from trusted manufacturers with reliable sources of genuine crocodile skins. Then VANGOSEDUN is your best choice. You have so many choices out there in the market when buying crocodile shoes. The industry of exotic shoes is ripe and there are plenty of online shops that offer “genuine crocodile shoes”. However, among all these, choosing VANGOSEDUN crocodile shoes is your best option for a number of significant reasons. Luxury: First of all, VANGOSEDUN shoes are completely luxurious. Hand-stitched and crafted by expert shoemakers, designed by the best artists, you can expect their shoes will always show your elegance. When you want to make an impression and catch the attention of everyone around you, VANGOSEDUN crocodile shoes easily accomplish what you are looking for. They have a wide array of designs and styles you can surely find the one that suits your style and preferences. Comfort: When producing exotic shoes, VANGOSEDUN always has your comfort at the back of their minds. It is always their goal to provide their customers with the most comfortable shoes. This is not only about the shoes that are stylish but are able to give proper support to your feet. VANGOSEDUN shoes are a most comfortable pair of shoes. They have been made from superior quality materials designed to offer your feet optimum protection and support. Quality: As mentioned before, VANGOSEDUN crocodile shoes are the result of expert shoemaking skills, exceptional design abilities, and genuine crocodile skins. They have been put together to offer customers with the highest quality shoes. It is not the price that determines the quality of shoes. With VANGOSEDUN, you can expect crocodile shoes at affordable prices but definitely high quality. The shoes are made from real crocodile skins. VANGOSEDUN ensures that every shoe made available uses only genuine and exotic skin sourced out from reliable farms and factories. Durability: Each pair of VANGOSEDUN crocodile shoes can last a lifetime. They are most durable, tough to any harsh weather condition, though of course it is advised that you take proper good care to ensure that they last for a long time. As compared to cheap imitations and ordinary dress shoes, VANGOSEDUN crocodile shoes definitely last far longer than and even up to a lifetime. Value: Owning a pair of VANGOSEDUN crocodile shoes ensures you get the value for your money. Every pair of crocodile shoes from VANGOSEDUN is completely-packed of all the qualities you are looking for a perfect pair of dress shoes. With durability, quality, comfort, and luxury it offers, you have nothing else to look for. You will never regret it getting a pair of VANGOSEDUN crocodile shoes. If you have always wanted to buy a crocodile shoe after hearing all the buzz of exotic shoes, VANGOSEDUN crocodile shoes promise you long-lasting charm and durability that no other affordably-priced shoes can compare. Although VANGOSEDUN shoes come cheap, real crocodile skins make the shoes. VANGOSEDUN crocodile shoes offer you style, class, high durability and comfort. This is also not to mention that they do not cost a huge chunk out of your money. They can also easily be matched to any shirt, suit or ties. You will also not find it hard to mix and match to achieve the look you want. With VANGOSEDUN, you can achieve a sleek and stylish look for a long time. Crocodile skin is indeed one of the luxurious and beautiful types of leather. It is exceptional, out of ordinary material that needs special care in order to prolong its lifespan and at the same time keep it in a good shape. Without proper care, the appearance and flexibility of your crocodile shoes diminish significantly. On the other hand, with proper care, your crocodile shoes should last for so many years to come. Caring for your crocodile shoes could be a breakdown into two categories, prevention, and maintenance. Damage Prevention: You need to keep your crocodile shoes from direct sunlight or moisture, as these can damage the components of the crocodile leather. The direct heat source or direct sunlight could cause damage and this might lead to the loss of natural shine. Moisture can also ruin your leather. Spilling any liquid on your crocodile shoes can result to the cracking of the leather. When your crocodile shoes get wet, you have to dry them right away with a clean, absorbent cloth, then leave your shoes to air dry naturally. Proper Care: It is essential to take good care of your crocodile shoes since its more expensive than shoes made of typical materials. Maintenance is not hard to do and most of all it doesn’t take so much of your time. Proper maintenance will help a lot in preserving your shoes and keep it in good condition. When you take good care of your crocodile shoes, always make it a point to use the best and ideal cleaning cream which is intended particularly for crocodile leather. Using the product containing harsh chemicals could harm your crocodile shoes and result to the darkening of the color. Always keep in mind that never treat your crocodile shoes with creams which are made for cowhide leather. Make sure to clean your crocodile shoes with a clean, soft cloth and the small amount of liquid prior to putting moisturizer. While crocodile leather is very hard-wearing, without proper maintenance, in due course the appearance and flexibility of the leather will weaken. When using conditioning products or any type of cleaners, make sure to try it first in an unnoticeable part of the shoes to know how the crocodile leather reacts. Always remember that polish can improve the shine of crocodile shoes, however, the compounds and oils on the crocodile leather should be replaced occasionally to keep these looking brand new. With regards to replenishing your crocodile shoes, it is essential to just use a conditioner which is particularly intended for the crocodile leather. Choose the product which will refill the oil and add water resistance. Always take good care of your crocodile shoes well in advance for the reason that once there is a presence of cracks, you can’t do anything to bring back its original condition. Damage prevention and proper maintenance can help you a lot in extending the life of your expensive crocodile shoes, and at the same time it helps shoes looking great, high-grade and it will last for so many years to come. Tags: crocodile shoes, men’s crocodile shoes, crocodile skin shoes, crocodile shoes for sale, crocodile leather shoes, crocodile shoes for men, genuine crocodile shoes, formal crocodile skin shoes, crocodile sneakers, crocodile boots, crocodile skin sneakers, crocodile skin boots, crocodile dress shoes.